This week America witnessed the continuation of a number of stories which have achieved notoriety over the past few months - all of which, in some fashion, touch upon explosive areas of racial tension. Following the Cherokee Nation's decision to revoke the tribal membership of approximately 2800 descendants of people the Cherokee once owned as slaves, the Congressional Black Caucus Foundation convened a panel yesterday to "examine the historical, legal, and current status of the Cherokee Freedmen Indians." In the wake of the Don Imus controversy earlier in the year, a Congressional hearing (" From Imus to Industry: The Business of Steretypes and Degrading Images") heard testimony in defence of hip hop's right to free expression from Mississippi rapper David Banner. More developments in the ongoing case of the Jena 6, six black Louisiana high school students charged with beating a white student in the wake of racist attacks: following last week's protest march on Jena, Mychal Bell has been released on bail posted by a benevolent stranger. In the first of an ongoing series in which AMS students share some of their Year Abroad experiences, Rebecca Hunt gives us two glimpses of her time at the University of Redlands, California. 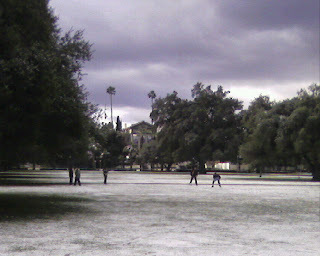 "During my time at Redlands, it snowed for the first time in 10 years. Many of my friends had never seen snow before and we all went out in our pyjamas (as it was early in the morning!) and made snow balls." "This photo was taken whilst driving along the Pacific Coast Highway to Orange County from Santa Barbara. Just after I took it I saw two dolphins swimming in the sea which was pretty amazing!" One of the most dramatic moments in the history of the American Civil Rights Movement took place 50 years ago today, on 25 September 1957, when nine black students desegregated Little Rock Central High School in Arkansas. 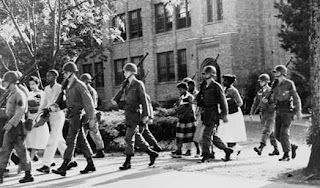 For weeks the pro-segregationist governor of Arkansas, Orval Faubus, had defied the law by ordering the state's National Guard to surround the school and prevent any black students from entering. Finally the long stand-off was ended when President Eisenhower sent the 101st Airborne Division to Little Rock. On 25th September the nine students were escorted under armed guard past jeering white mobs and into the school. In defiance of powerful southern segregationists the President threw the weight of the federal government behind the legal rights of the black students, thus helping to energize the emerging Civil Rights Movement. Occurring under the glare of national and international media publicity, the Little Rock crisis became an iconic and defining moment in modern American history. Read more about America’s commemorations in the New York Times and the Washington Post. A warm welcome to all new AMS students; welcome back to those who are returning; bon voyage to our year abroad students. Good luck to all for the forthcoming semester. The full story can be followed in the Gainesville Sun; comment can be found in the New York Times and the Washington Post. Today, University of Florida students have been staging marches and sit-ins in protest. Meyer's plea to police, "Don't tase me, bro," has become a rallying cry. This weekend, AMS is very happy to be hosting its second international conference in two weeks. 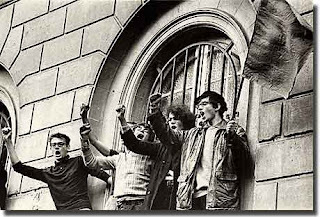 Following the signal success of Race, Memory and Reclamation, this weekend's 1968: The Year of Living Dangerously American Studies Network conference will be exploring the events of that tumultuous year from a variety of perspectives. A warm welcome to all those attending. Another news update to mark the start of Race, Memory and Reclamation today. Following this summer's well publicised Big Brother / Michael Richards / Don Imus 'n' word debacles, black American comedian Eddie Griffin was last night removed from stage for repeatedly using the word - as reported by the Guardian. This is symptomatic of a wider movement in America, spearheaded by the Abolish the N-Word organization. A warm welcome to all of those who are attending this weekend's AMS conference, Race, Memory and Reclamation. A full conference programme, including abstracts of proposals, is available here. Brown University has launched a commission "to consider how best to publicly acknowledge Brown's ties to the transatlantic slave trade and the history of slavery in Rhode Island"